Every dot in this picture is a galaxy. There are 3,000 in this, alone. 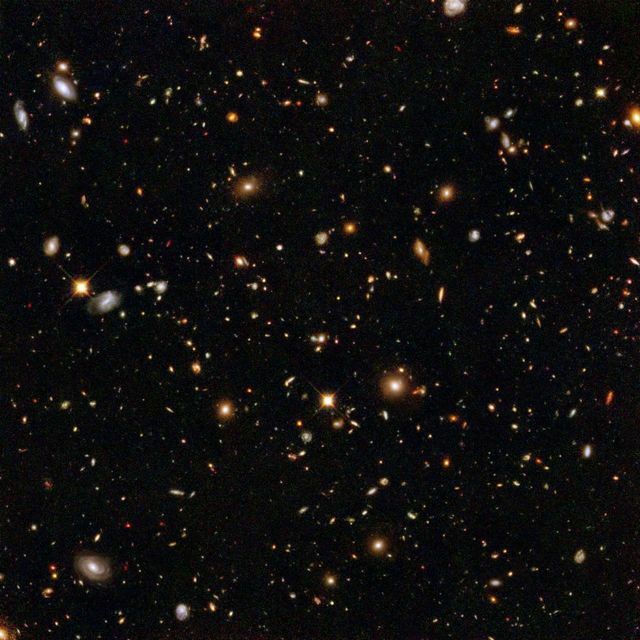 If you held up a dime at arm's length, the area of sky that contains these galaxies is about the size of Roosevelt's eye on the coin. There are globular clusters so massive, they bend light around themselves. Those blue streaks are all one galaxy, reflected multiple times around the mass of stars in the middle. That blue galaxy is actually behind the globular cluster. 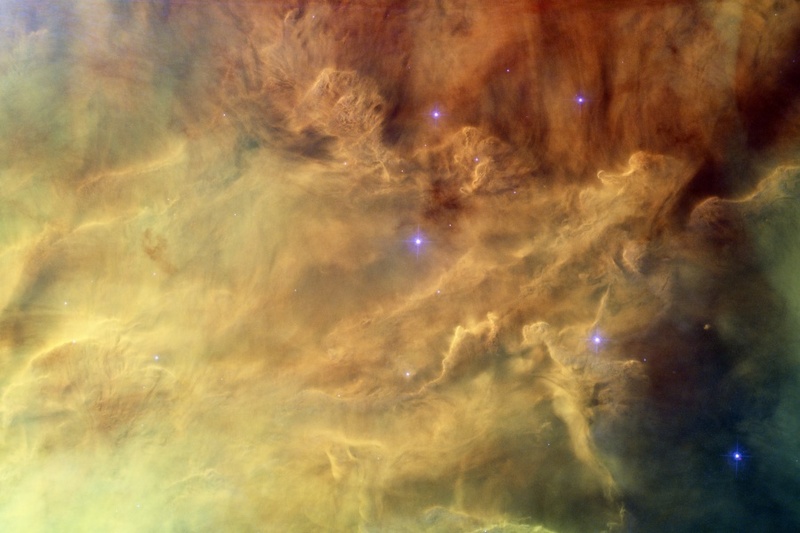 Ionized hydrogen gas, light years across, glowing with stunning colors as solar winds and radiation strip electrons from hydrogen atoms. Milky Way, home sweet home. 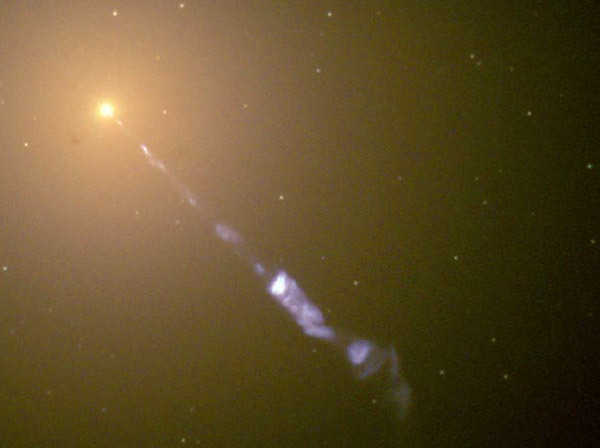 The bright part is thought to be a supermassive black hole that is attracting millions of stars. It could be anything, though. We don't know! Our solar system is located in a small spur off the Saggitarius Arm. 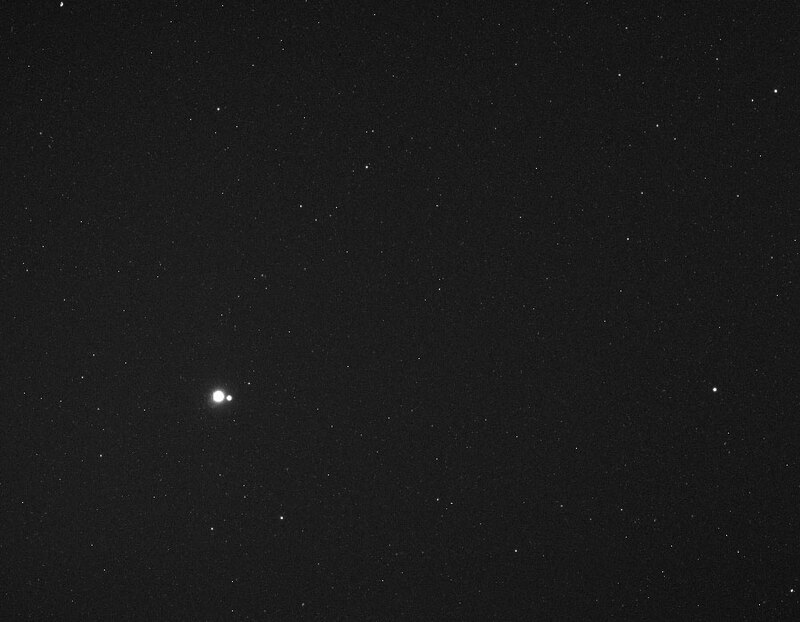 Earth and Moon, from Messenger. 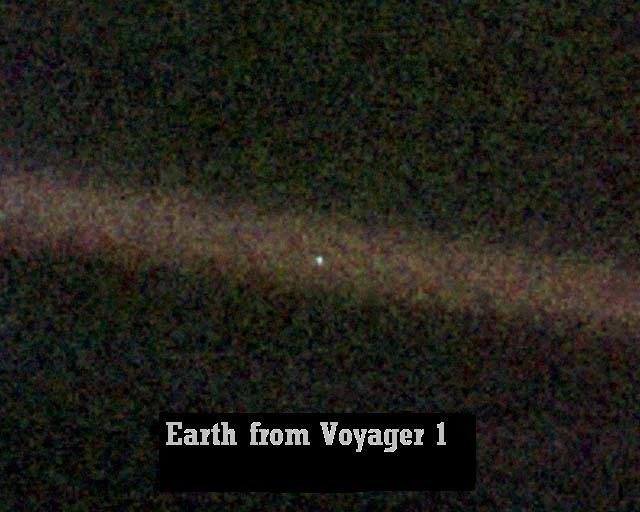 Look at how small and lonely we are. I'm not very good with words. I just wanted to share one of my favourite quotes about this tiny, insignificant little ball of rock and metal, screaming through space around a massive ball of fire, in a backwater spur off the arm of an average galaxy, spinning through space so empty, so vast, with so many other galaxies that our minds can't even comprehend it. 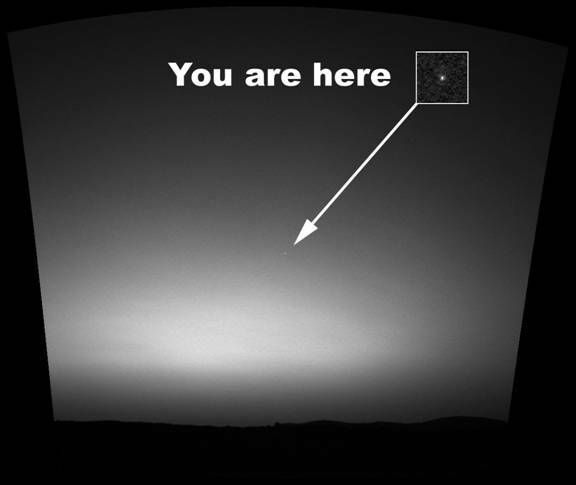 "From this distant vantage point, the Earth might not seem of particular interest. But for us, it's different. Look again at that dot. That's here, that's home, that's us. On it everyone you love, everyone you know, everyone you ever heard of, every human being who ever was, lived out their lives. The aggregate of our joy and suffering, thousands of confident religions, ideologies, and economic doctrines, every hunter and forager, every hero and coward, every creator and destroyer of civilization, every king and peasant, every young couple in love, every mother and father, hopeful child, inventor and explorer, every teacher of morals, every corrupt politician, every "superstar," every "supreme leader," every saint and sinner in the history of our species lived there – on a mote of dust suspended in a sunbeam. I think, even with all our problems, most of which we cause — we'll be okay. Last edited by Bourin; November 27th, 2010 at 11:14 AM. It's stuff like this that makes me want to live long enough to see humanity reach the stars and spread out throughout the galaxy and the universe. But alas, we'll be long dead by then . Someone needs to link that famous star size chart video, which shows just how small our home and sun is compared to the Hyper Giants like CV Cannnis Majoris or something. This makes messing up a drawing a much less daunting thing than I used to think it was. Same here. I feel sad that i might not experience it but i do not give up hope, maybe there will be some gene treatment in the next 40 - 50 years or something else that might prolong my life. Maybe some alien race will drop by and sell us technology or the vampires will out them self. The sad thing is that if we develop ways to extend our lifetime significantly, probably only a small split of the population will be able to afford it. The body is a pretty simple machine, it can be fixed with duct tape or bio-mechanics. Failing that, consider the fact that your body is constantly rebuilding itself, no molecules exist in it which were there 10 years ago. It's just a matter of taking control of those processes. The real challenge is preserving the brain, it seems likely that we will eventually need to download our brains into computers in order to become effectively immortal, and with the impending advent of quantum computing, that could definitely happen in the next 100 years. This guy brings up the interesting concept of a metaphorical 'escape velocity' of medical science, It's kind of like a threshold, where the remainder of your projected life expectancy becomes more than the the rate at which life expectancy is increasing. Technically that's not an accurate way of describing it, but it gets the idea across. Sure the time-periods he guesses are a little optimistic. But the logic is sound. What scares me is the likely scenario where we would end up only living as long as we could afford to. And given the current economic system, everything about us which is human will eventually be bred out of us due to the new natural selection, leaving us as nothing more than the machines we inhabit. Last edited by karma militia; November 27th, 2010 at 08:24 AM. Once, when I was bored at work I calculated that if the classic finite universe was shrunk to the size of the Earth, a single spec of pollen would be big enough to accommodate our entire Solar System about 6000 times over. Trouble is, even that doesn't give us a real idea of the size of the universe because we can't imagine the scale of objects bigger than, say, mountains, or much smaller than we can see, as evolution hasn't prepared us for that. So whilst we can say yep, the Earth is big, we can't actually imagine how big. Let alone the Sun (http://www.youtube.com/watch?v=jJ8UAMR98y4), or our Solar System, or the Milky Way, or the universe. Or any other universe. When you take all this into consideration, the thought that we are the only life in the universe is just silly. Even if the chance of having intelligent life forms was 0,00001%, there are still countless of planets. I bet that there are at least thousand habitable planets somewhere with their own people who are thinking about the same thing. And the thought that I'll never find this out really saddens me. I don't want to live forever, I just want the answers. Yeah the similarities between a solar system and a molecule are truly disturbing. Makes me wonder if each proton/neutron/electron has something like a solar system inside it, or if our universe is one of many which revolves around, or is revolved around by, other kinds of universes. Or maybe both? Or maybe some kind of 'klein bottle' scenario where both are true of the one simultaneously. I think my brain just got a 'blue screen of death'. ...I was going to link a screenshot of a BSoD, but then i found this, which i find quite artistic. Karma, they only look the same because of the bad conceptual drawings in the science textbooks. For example, the "spin" of a particle isn't really a spin as we understand spinning. yeah i know a little bit about quantum physics, the whole probability thing, how the electrons are apparently mushed out over an area until you try to measure their position and velocity, but they are still (theoretically) finite things orbiting a central 'mass' (for lack of a better word). There are still 'spooky' similarities, i think (i'm not sure). From memory, the order of magnitude of the known microscopic is almost identical to the known macroscopic (from our perspective). Of course this is probably just a fluke caused by the perspective we began with. It's impossible to say. Last edited by karma militia; November 27th, 2010 at 02:15 PM. it is all just data. In fact it is a bit similar to a game engine, a very sophisticated and complex one of course and we live inside. We could be a part of this simulation, virtual world without ever even knowing it because the creator of such a world would not be based on the same principles as we are, the creater/s would reside outside of this simulation. Also, if that's true. How far developed does a computer game have to be to be considered a second reality? When we succeed creating a strong AI we will be able to seek out more answers for sure and we will be able to experiment. We in fact could create a virtual environment, it does not even has to be as complex as our world, we would give the AI all the basic senses and make it able to interact with the virtual environment. It does not have to emulate our laws of physics, we can create and add completely new properties but within the simulation they will be logic, the AI will only understand the world within the boundaries the AI can operate, the AI may create theories but no matter what it does it would never be able to prove the existence of the creator or grasp our world. That is of course if the AI is contained in a virtual environment. We can of course also make the AI interact with us in our world, we can give it a body, eyes and means to communicate. There are many interesting projects, algorithms learning to maximize the movement capacity of robotic limbs, they learn walking, jumping and other movements to a extend where they master it with great elegance and affiance. This is of course not a strong AI but it may be so that everything can be decided in tasks, like for example programms with the only purpose to operate the limbs, walking and so on. check this one out, its very cool. The computer simulation theory demonstrates the folly of trying to analyse reality using only maths. err, i donno about that. 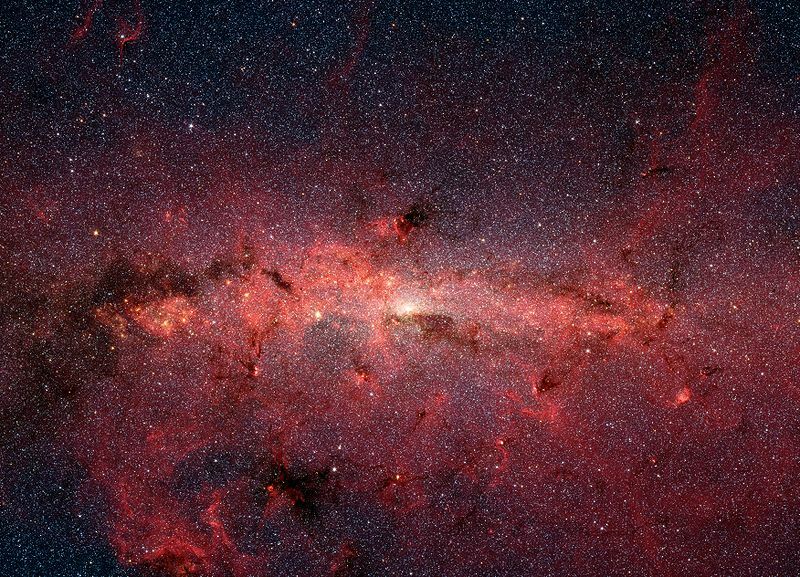 Maths has taught us a lot about the universe, it's the closest thing to an objective perspective we have. Of course maths might just be a construct of our minds, but it's still the best method we have. A hard AI is not just math, if it was just math we already would have created AI. I was not talking about emulating our universe but rather simulating life in a artificial reality. I hope to see success in this sector (hard AI) before i die. But maths needs a framework in order to apply it. The argument is that if humanity lives long enough then we will create millions of simulations and therefore we, now, are more likely to be in one of those simulations than not. Fine if you're arguing from a simple stats perspective, not fine if you examine it from a broader viewpoint. A computer simulation is just that, a simulation, 0s and 1s. I don't want to bang on about consciousness again, but for an element of a simulation to 'believe' anything then it needs to be conscious, and that is impossible, even in theory. A virtual thing cannot be conscious. You could argue that the physical computer itself is conscious by virtue of its complexity but an element in a simulation cannot possibly be conscious because that element does not actually exist. It is a simulation. You're therefore only left with simulated consciousness and that cannot, by any understanding we have of consicousness, exist. Another downside is that the argument would only apply if the physical universe is (a) finite (b) unique and (c) one-time. None of these are even approaching being proven. Any of these would render the chances 50:50, assuming you accepted the premise. In any event, it's simply a silly argument. 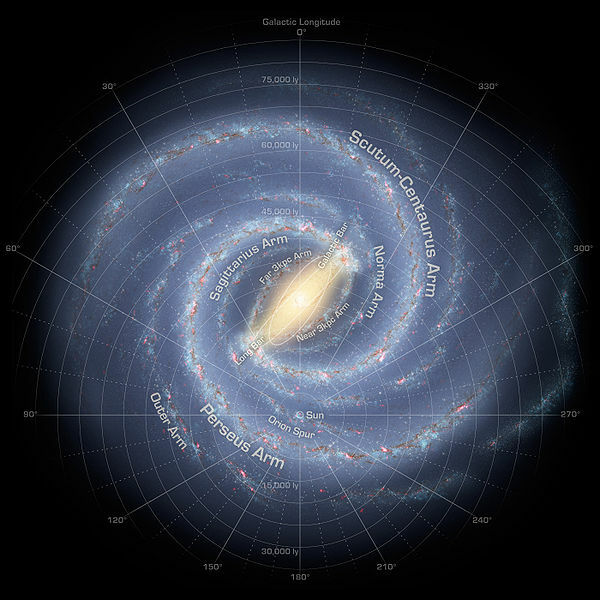 Why would the contents of a simulation mirror the physical laws of the universe that contains it? It wouldn't. Indeed, it wouldn't even be likely. 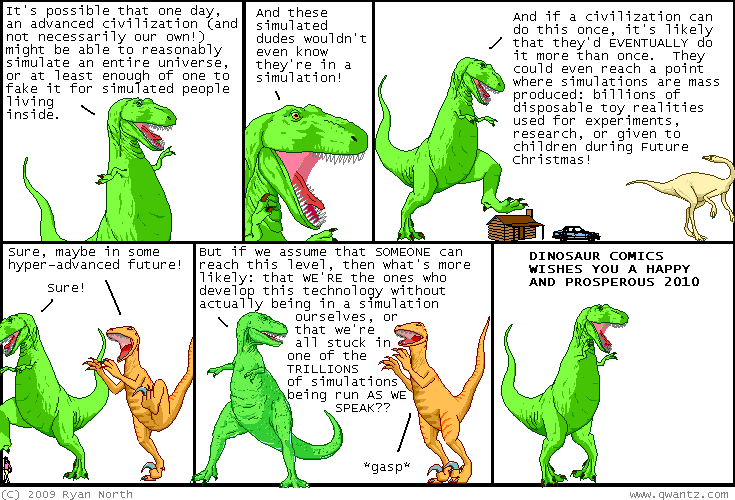 Almost all the simulations we see are of imaginary environments. Which means that the 'real' universe could be anything at all and in turn, it would be almost certain that our simulation universe is completely different to the real one. Therefore we've deduced that the 'real' universe is... anything at all. It's like working out a maths problem and finding 0=0, you haven't really proved anything. And aside from all that, if we accept the simulation argument we are actually more likely to be in a simulation of a simulation. Of a simulation. Of a simulation. Ad infinitum. Pointless thinking about it, really. A virtual thing cannot be conscious. It can be conscious of it's own virtual reality. It can be aware of what's happening inside its own program and consciously draw conclusions from that experience. Just like we're conscious of our surroundings but oblivious to what goes on outside our own reality. A computer simulation is just that, a simulation, 0s and 1s. What's to say reality itself can't be broken down into ones and zeroes? To me that sounds like the most logical starting point for any kind of existence. It can be conscious of it's own virtual reality. It can be aware of what's happening inside its own program and consciously draw conclusions from that experience. Ah, but it can't though. There is no definition of consciousness as far as I'm aware that allows for virtual consciousness. It's not the same as having a rock, simulating the properties of that rock and concluding, correctly, that you have a virtual rock. In a virtual environment there is nothing to be conscious in the first place. If consciousness did arise it would have to be from the physical machine producing the simulation. It's possible, I'm not saying that's the reason for the failure of the simulation argument, I was just saying it's true. A computer simulation is not just 0s and 1s, that is not how it works. the 0s and 1s is just the base/platform, the most simple information, a switch, on - of. Sure you can display the whole code of a application as 10010010101001... but the application is of course not written in binary numbers, it is written in a language. The binary numbers stand for letters and numbers blab la I assume everyone knows what a computer language is. The AI and the Environment does not have to be the same program btw. To break it down really simple: Picture the hard AI as Computer A, Give computer A eyes (webcam) and let computer A only see a projection that is simulated on Computer B. But 0s and 1s are more fundamental than the language. The language is translated into 0s and 1s for processing to occur. The language - the application code - is entirely for human interpretation. The application code as we see it does not 'run' and the computer has no concept of it. Indeed, a single machine language executable can be reverse engineered to any language, providing that language allows for the functionality. You would not write the physics like in a game engine of course. There are some interesting approaches emulating and simulation a human brain, you can find numerous articles on that subjects on the internet. One day we might have not only sophisticated software but also hardware mimicking the human brain, there are in fact approaches in this direction already. Chips mimicking neurons. Thanks to quantum physics we may have computer powerful enough to actually emulate a human brain that could be fed with information and trained. That won't happen for a while mate, right now all they can do is dodge stuff, walk, appreciate shakespeare, aim at targets, stuff like that.